This tailor made Discovery tour includes the most highlights in Siem Reap. With three days to explore the Angkor Archaeological Park, there is no rush. To see the biggest freshwater lake in SEA, Tonle Sap Lake, is a must. No visit to our region would be completed without exploring Sambor Prei Kuh. And to finish in style we invite you to discover Artisan d’angkor as well as Siem Reap night markets. Please be our guest and let us guide you through our land. We are ready when you are. Arrival and transfer to the hotel for check-in. Rest of the day, intro-tour around the town by Remork (Tuk Tuk). Visit Prasat Kravan, Pre Rub, Eastern Mebon and Banteay Srei. After lunch, Take a short walking tour in the village and see people making palm sugar, Next Akira landmine museum. Afternoon, Angkor Wat, the main highlight temple till dawn. Visit Southern gate of Angkor Thom and temples in this great City before continue to Ta Prohm, the ruin in the jungle. Afternoon, Relax at the hotel till 15:30, start your visit to artisan d’Angkor and scroll around at the night market. Today, you will leave Siem Reap and explore on the outskirt of this small city. As the plan, you will take your overnight at Kampong Thom for 1 night. 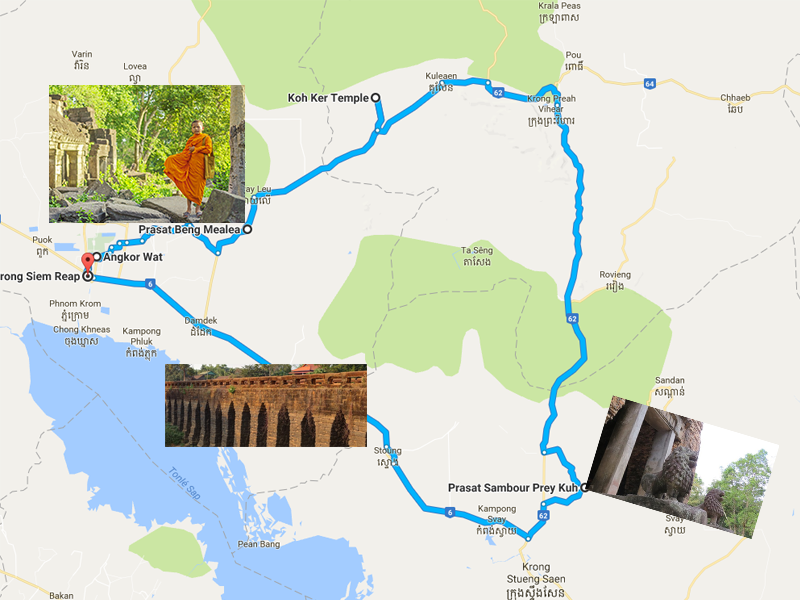 The trip today will take roughly 6-7 hours drive with the visit of Beng Mealea, Koh Ker. Visit Sambor Prei Kuh in the morning. The tour at this bush temples shall include a 15 minutes bicycle ride on yourself (it’s just for fun). On the way returning to Siem Reap, you will take a short stop at Kampong Kdei Bridge for some photos. Check in at your hotel and overnight. Today is your last in Siem Reap. Either relax at the hotel or scroll around in the city on your own. Pick-up and transfer to airport …. (depends on your flight time).